'You know you're in for a treat when you open a Jenny Oliver book' Debbie Johnson From the top 10 best-selling author of The Summerhouse by the Sea Hannah’s holidays are normally spent nibbling chocolate coins with her daughter and praying she’s not too old for a stocking on Christmas morning. But this year, she’s been offered the dressmaker’s job of a lifetime: creating a one-of-a-kind a gown for her friend Annie’s Christmas wedding on the picture-perfect Cherry Pie Island. 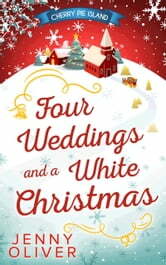 Many mince pies and one hot-pink organza dress later, Hannah is set to snuggle back into her old routine…until she discovers that there are three more weddings to come – and not a dress in sight! Four themes, four brides and four parties spent avoiding chef Harry Fontaine, whose cynicism is as much a wedding day guarantee as confetti and cake. Hannah has her work cut out for her! 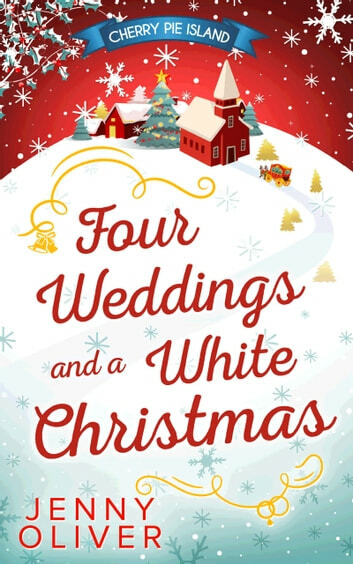 Yet, with a sprinkling of snowflakes and Christmas magic, it could be that this is the year when miracles really do happen…if Hannah will let them. Praise for Jenny Oliver ‘a very uplifting story full of happy endings and guaranteed to make you smile…absolutely perfect for Christmas.’ – Goodreads ‘a fitting and fabulous finale to the series’ – Goodreads ‘Best enjoyed with a mug of mulled wine whilst listening to Bing Crosby’ – Goodreads ‘another slice of warm Cherry Pie Island charm’ – Goodreads ‘The dresses, the food, the weddings, the travel, the winter walks in Manhattan… I loved it all! ‘ – Random Book Muses Welcome back to Cherry Pie Island…The most delicious place to spend Christmas! Perfect for fans of Holly Martin, Jenny Hale and Cathy Bramley. The Cherry Pie Island series The Grand Reopening of Dandelion Café – Book 1 The Vintage Ice Cream Van Road Trip – Book 2 The Great Allotment Challenge – Book 3 One Summer Night at the Ritz – Book 4 Four Weddings and a White Christmas – Book 5 Each part of Cherry Pie Island can be read and enjoyed as a standalone story – or as part of the utterly delightful series.